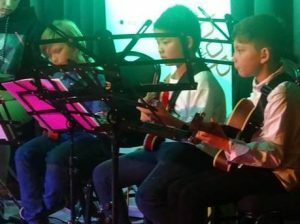 If you live, work, or go to school in North Sydney we can offer you high-quality guitar lessons with experienced, professional teachers. The JWA studio is located just five minutes from St Leonards station. We are Saul Richardson and Yutaro Okuda and we can help you or your child become great at guitar. An emphasis on good technique from the very first lesson. This makes for great, efficient playing later on. Are the lessons on North Sydney? Our students can play in groups and perform. We give our students more than just private lessons. No, but very close! Our studio is just five minutes from St Leonards station, a handful of stops from North Sydney, Waverton, or Wollstonecraft. There are easy busses up the Pacific Highway or a nice walk up Miller St and then through the bustling village of Crows Nest with its many restaurants, cafes, shops, and bars. It is a nice area to visit after school or after work. Our studio is at 58 Atchison St, St Leonards. Who gives the guitar lessons? We are Saul Richardson (B.Ed hons, MACE) and Yutaro Okuda (B.Mus, Dip Mus). Saul is a well-known jazz educator and the co-founder of Jazz Workshop Australia (JWA). Yutaro is an experienced teacher and a busy performer too, playing jazz, contemporary, and commercial music. We specialise in jazz, but teach contemporary styles and general technique too. Naturally, we both have Working With Children certification, just like all the other teachers at the JWA studio. Our students have achieved great success. Many have gone on to become professional musicians, most do brilliantly in HSC performance, and plenty have kept playing music as an important and enriching part of their lives. Use the form on this page, or the more detailed contact form for this website if you prefer. 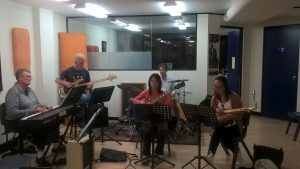 You are welcome to email us: info@jazzworkshopaustralia.com.au, or phone (02) 99665468. If you or your child work or go to school in North Sydney or the lower north shore, then we do hope you’ll consider lesson with us.